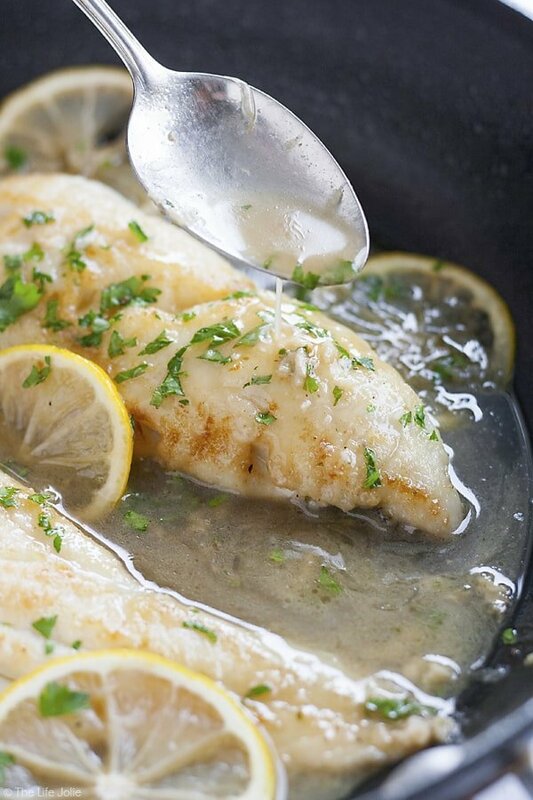 This Date Night Fish for Two with a Lemon Sherry Pan Sauce is such an easy date night recipe option! 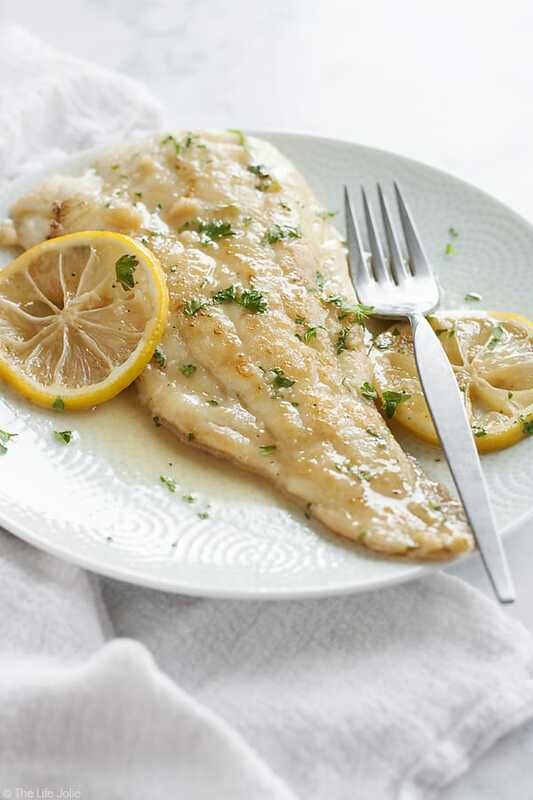 It works great with any white fish and is the best way to use a few simple ingredients to create a healthy and delicious treat for dinner with the person you love. This is perfect for Valentine’s Day! My in-laws spent the Christmas holiday with us this year. It was pretty fantastic having them. I also took a little extra time off of work to get more quality time and prepare for T’s first Christmas. Whenever they come and visit, my mother-in-law Vicky usually cooks at least one meal (or more depending on how long they’re in town) in addition to helping me on the nights that I cook. Even though I love cooking, I look forward to these nights because she always makes something delicious. There’s something about our moms (and moms-in-law) with their tried and true recipes. They always get it right! I hope some day my kids and their spouses view me this way, because I certainly don’t always get it right. Anyway, the day before Christmas Eve- Christmas Eve Eve?- we spent the morning at a local trampoline park that has become a favorite place to take A, since they have certain hours that are designated specifically for toddlers and I don’t have to worry about any big kids trampling my gal (though, I suspect she’d be able to hold her own). After that we headed over to Wegmans to get some lunch and pick up some last minute items for our holiday dishes-to-pass. On our way, we realized we should probably grab something to make for dinner and realized that we were all craving fish (Justin clearly was not a part of his conversation since he’s such a picky eater. But he ended up with chicken, so all’s well that ends well!). Now I should tell you, I am a lover of all things seafood. But when it comes to fish in my land-locked part of the country, I tend to prefer salmon. I find it super flavorful and it’s easy to come by pretty great quality salmon around here. Although I still like other fish, but I find the wild ones that are most readily available in my area to not be as flavorful as I like. I still eat them and enjoy them but I just gravitate toward salmon for some reason. That night we went with wild Haddock. Vicky worked her magic and we sat down and enjoyed a great dinner as a family. I knew from the first bite that this would be a fish dish that I make over and over again. 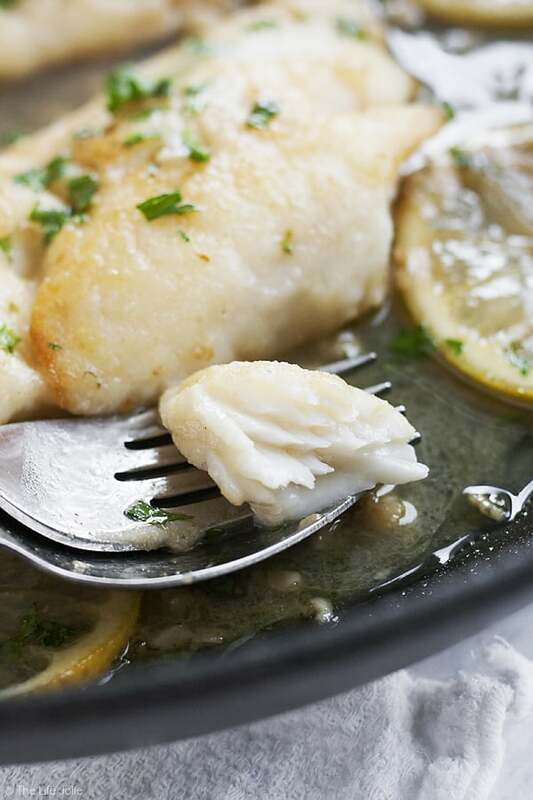 Haddock is a pretty mild white fish. It’s quick and simple to prepare but in my opinion it’s best served with a flavorful sauce. Let me just say the Lemon Sherry pan sauce that Vicky made really brought this fish to a bright and tasty level. Additionally, it was super simple and quick to prepare with minimal work involved. I knew I wanted to share this recipe with you, my dear friends. And the more I thought about it, the more my brain kept connecting this dish with the idea of a romantic date night. It’s easy to prepare, full of delicious flavor, but also light enough that you’re not feeling terribly uncomfortable and weighed down when you finish (though still satisfied). I think you can use any mild white fish with this. I usually gravitate towards haddock or cod (I’m not really a Tilapia fan but that could also work). Halibut, Grouper and Mahi Mahi would also be delicious, though not as budget friendly. I adapted the recipe for two, to make it an excellent date night dish (who’s planning for Valentine’s Day?!) but you could always double it to cook for your family! 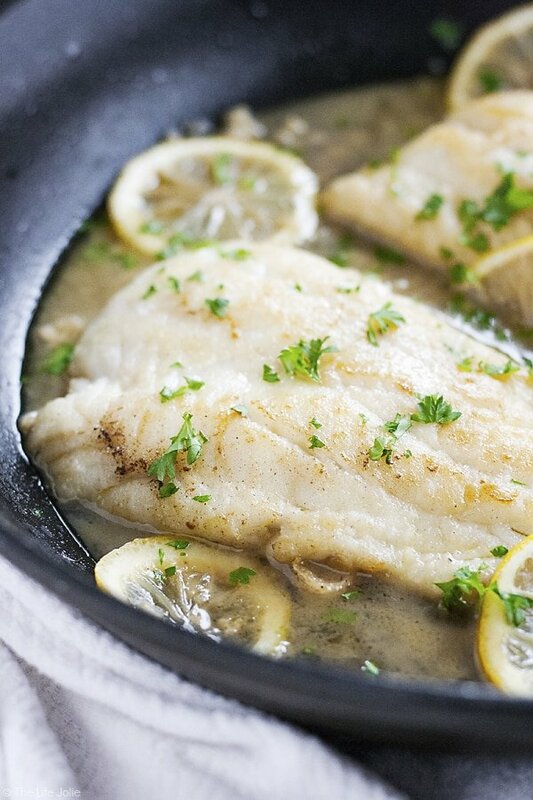 This Date Night Fish for Two with a Lemon Sherry Pan Sauce is such an easy date night recipe option! 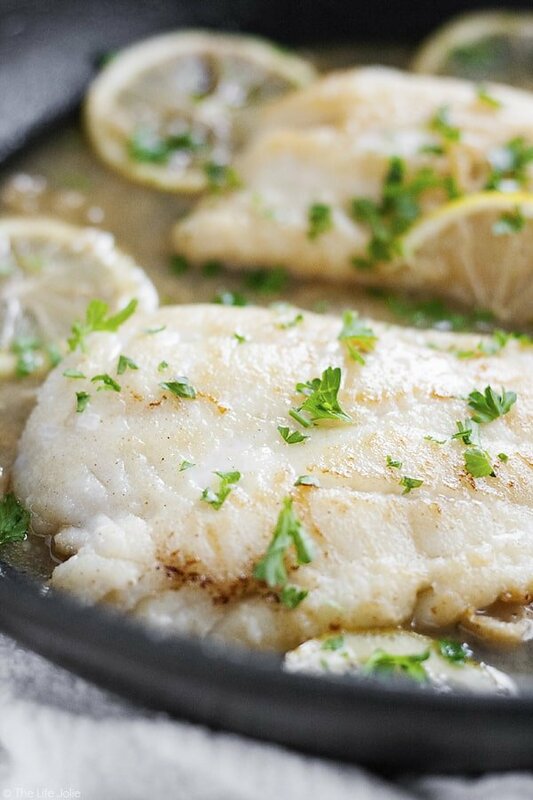 It works great with any white fish and is the best way to use a few simple ingredients to create a healthy and delicious treat for dinner with the person you love. This is perfect for Valentine's Day! 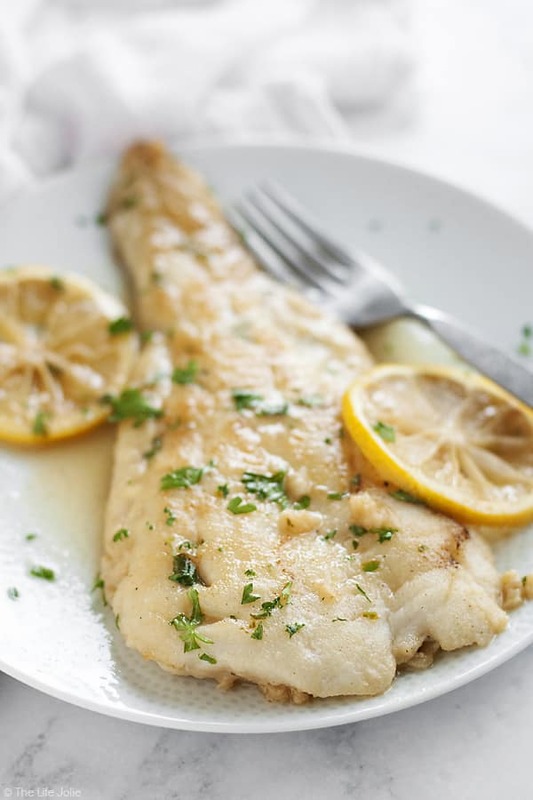 Pat your fish dry and then dredge it in the pan searing flour so that the entire piece of each fish if fully covered. Tap off the excess and set aside. In a pan over medium high heat, melt 1 Tbsp. of butter with your olive oil until the pan is super hot. 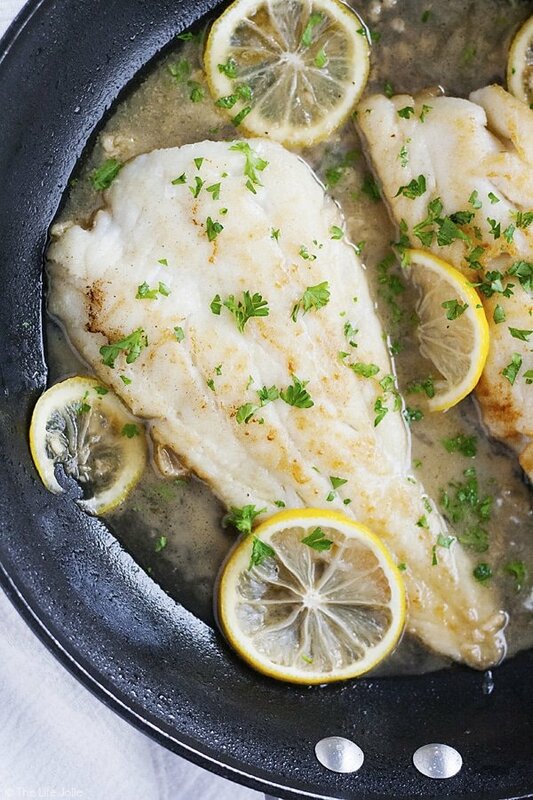 Place your fish into the pan and sear each side of the fish until it's a nice golden brown, around 2 minutes per side. Remove the fish to a side plate. Add your other Tbsp. of butter to the pan and reduce the heat to medium. Add your minced garlic and saute for about a minute, stirring often so it doesn't burn. Deglace the pan with you Sherry, scraping the bottom of the pan with a wooden spoon to get all the flavorful bits pulled up and then add the lemon juice and some salt and pepper to taste. Let it simmer for a minute or two and then add your fish back in along with the lemon rounds. Cover and simmer for 5 minutes and then uncover and simmer for around another 5 minutes or until your fish is fully cooked. Sprinkle with chopped parsley and enjoy! You can substitute regular flour but if you do this, make sure you add some salt and pepper to it. I tend to use haddock or cod- if you use a meatier fish, adjust your cooking time accordingly. Cooking times may vary based on how well your stove works (gas is always a bit quicker in my opinion) and what you're cooking on. I used a non-stick pan so that doesn't conduct heat as well as cast iron or stainless steel so watch your fish and use common sense (the latter two options will likely give you a better crust on the fish). Don’t forget to follow The Life Jolie on Pinterest for other amazing recipes! (Sort of) Detox Lentil Soup Tessa is 10 months old! January 12, 2017 at 11:25 pm Thank you, Elaine :) I hope you give it a try! January 11, 2017 at 3:32 pm Wow - that photo of the flaky fish has my mouth watering! I can't wait to whip up some light, buttery, and lemony seafood for myself. Luci's Morsels | fashion. fun. frivolity. January 12, 2017 at 11:25 pm Thanks Luci- I was really happy with how light it all was! January 11, 2017 at 3:38 pm Everything is right about this fish recipe. So yummy. January 12, 2017 at 11:26 pm Thank you- I hope you love it as much as we did! November 6, 2017 at 8:56 pm What Sherry did you use? November 7, 2017 at 8:35 am I used the cooking sherry thy sell at my grocery store. March 2, 2018 at 5:25 am Where do I purchase searing flour? Didn't realize there was a different type. March 2, 2018 at 2:23 pm Hi Tamika! Mine wis Wegmans brand but you can also use Wondra because it has the finer consistency that the pan searing flour does.